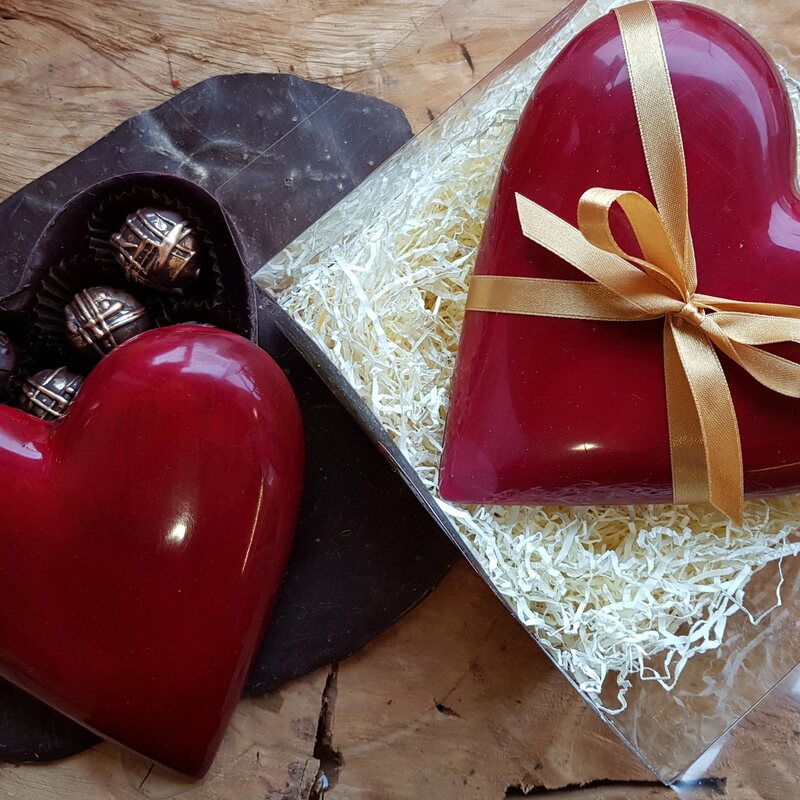 A beautiful handmade chocolate, a great gift for your loved ones, filled with Bianca Marton's fresh chocolates. It is great for all celebrations. The chocolate heart is 145 mm wide, weighs approximately 150g, and contains 10 chocolates. 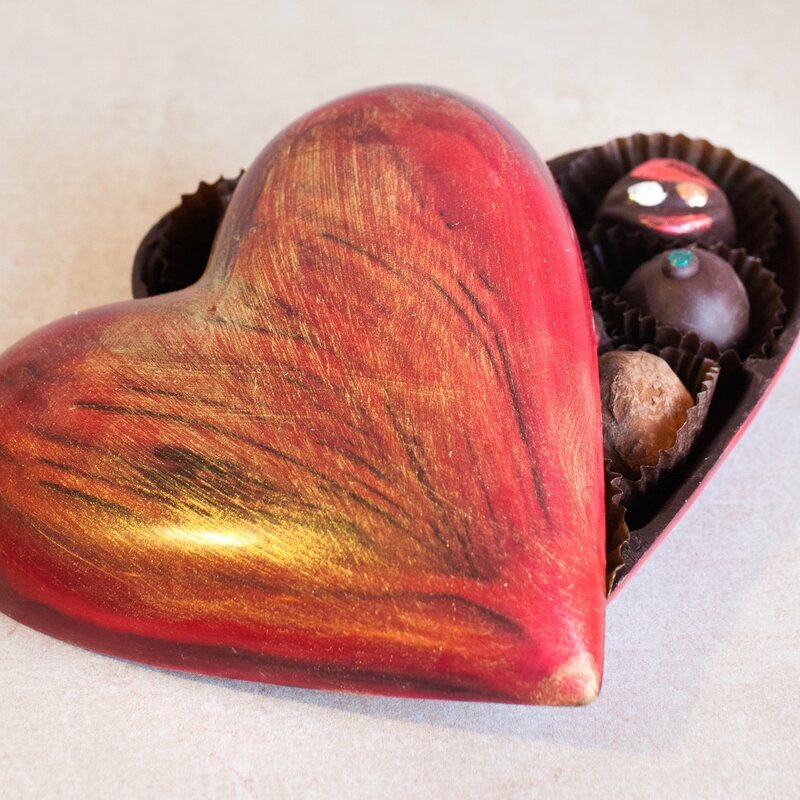 Each chocolate heartis individually hand-decorated, no two are identical. They are predominantly in shades of red, purple and gold. Flavours may include: Mint and Maple*, Nicaragua*, Tanzania, Tonka, Cardamom, Sea Salted Caramel, Coffee-hazelnut, Coconut, Ginger, Peanut Butter, Hazelnut, Orange, Lemon, Raspberry, Passionfruit & Mango, Champagne, Plum Schnapps, Vodka Cherry, Rose, Violet, Geranium and Peppermint Creams. *Academy of Chocolate and Great Taste Award winners. 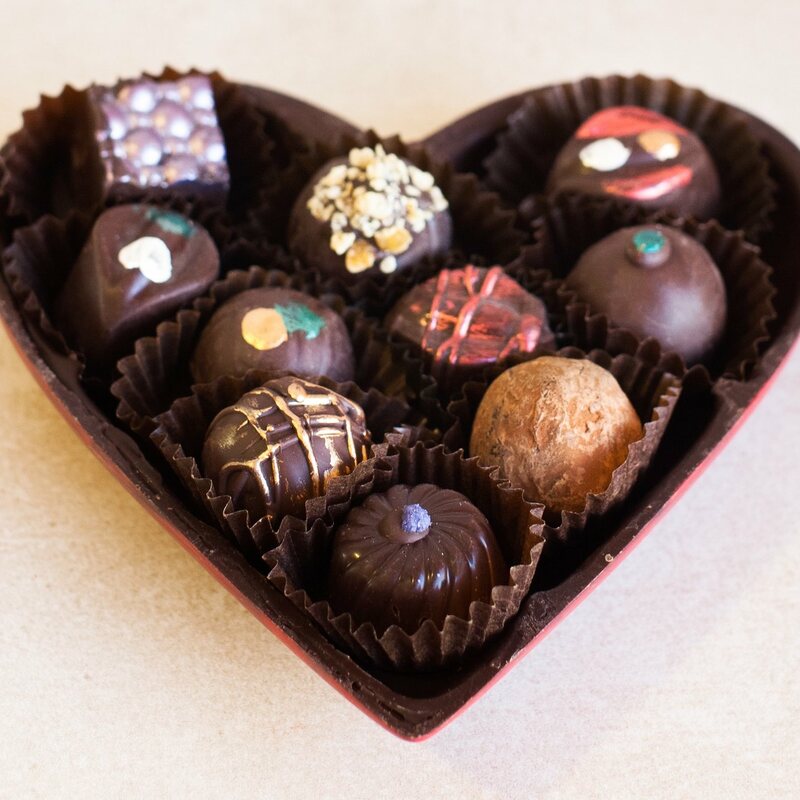 The truffles contain no artificial sugars or preservatives, so eat as soon as possible, preferably within two weeks. Suitable for vegans, dairy free. You may let us know what flavours you'd like by choosing the Customised Selection option. You can also choose a no alcohol selection. These hearts are fragile, so it will be sent in a box safely tucked up in food safe, eco-friendly and decorative shredded paper. Truffles taste best at room temperature, but they need to be kept in a cool and dry place away from radiating heat or sunshine. Your chocolates will stay fresh longer in the fridge. To maintain their quality please pack them airtight in a container or freezer bag before putting them in the fridge. When you take them out please leave them in the airtight packaging until they reach room temperature - this takes about 2 hours. After this you may safely open the container and enjoy the chocolates at their best. Contains soy, some flavours contain nuts. Made in an environment that processes nuts and gluten.